You are visiting the "Training" page. Links to the right will take you to sub-pages within the "Richard Smith" section. The links with asterisks in front will return you to either the parent or to the "Home" pages. Click on any thumbnail size image below to enlarge it, then click on your browser's back button to return to this page. Fen at approximately one year old having a training session on all her commands. She is now on ‘voice’ and ‘whistle’ commands. 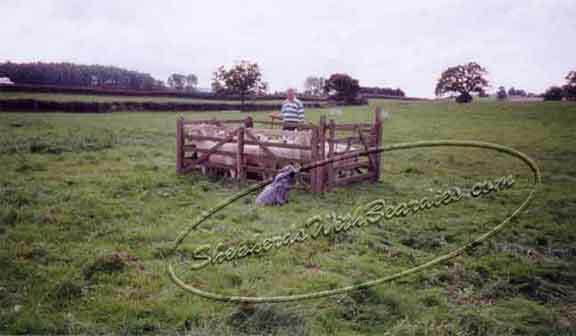 Richard and Fen penning sheep. This photo of Richard and Blue was taken July 25, 2004 at Hoo Farm, Near Telford, Shropshire. There is an article written about this day on the "Articles" page. Richard had to first complete some basic training with Blue, i.e., "stop behind" (meaning walking to heel, "lie down" (lying down immediately) and "walk on." 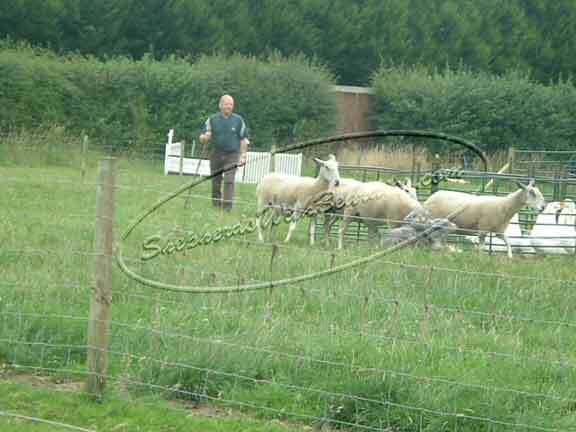 It is only then that Richard was able to consider moving her training on and allowing her to train on the sheep. 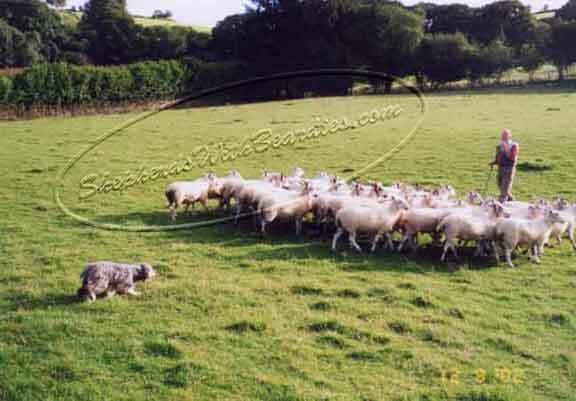 She has now entered the stage of "come bye" (gather the sheep/run the perimeter of the field in a clockwise direction), and "away" (gather the sheep/run the perimeter of the field in an anti-clockwise direction). This is what was being practiced in the picture at left. Blue has a way to go before she will complete her training, but Richard is very happy in her progress at this point. She is young, and her training cannot be too tense at this age. Although Blue is quite young, her confidence is incredible. She is full of character and will not be intimidated by the sheep, who because of their size and her immaturity, can try and stand their ground. When faced with this, she will "get in" and move them on. Being able to work the sheep in this controlled manner at such a young age is a good indication of the excellent combination of Blue's excellent working parents, intelligence and deep rooted instinct.